Hello friends! It's time for the first Two for Tuesday feature of 2019 over at the new Divinity Designs Blog. The Tickled Pink stamp set was used to create both of my Two for Tuesday card samples. Creative Nugget: All three panels were cut with Pierced Rectangle and Double Stitched Rectangle Dies. The patterned paper is a leftover scrap from the Beautiful Blooms Paper Pad. 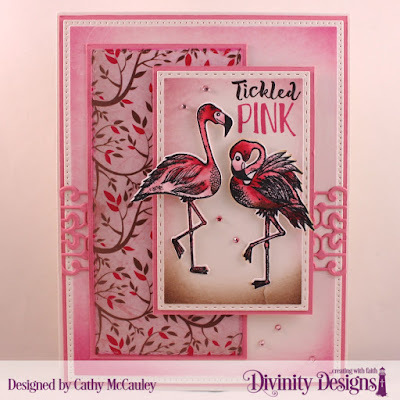 Flamingos from the Tickled Pink stamp set were colored with Copic Markers and cut with the coordinating Flamingos Dies. The border across the center of the card was cut with the Trellis Strip Die. A few gems were colored with a Copic Marker and added to finish the card. Creative Nugget: The new Petals Stencil was embossed and Texture Paste was added to the raised areas on this stepped up version of the card above. The happy birthday sentiment was added to a layered banner cut with Pennant Flag and Double Stitched Pennant Flag Dies. Since this card will be for my little prayer daughter at church, her age was added with a Numbers die cut. Beautiful cards! That's a really cute stamp! 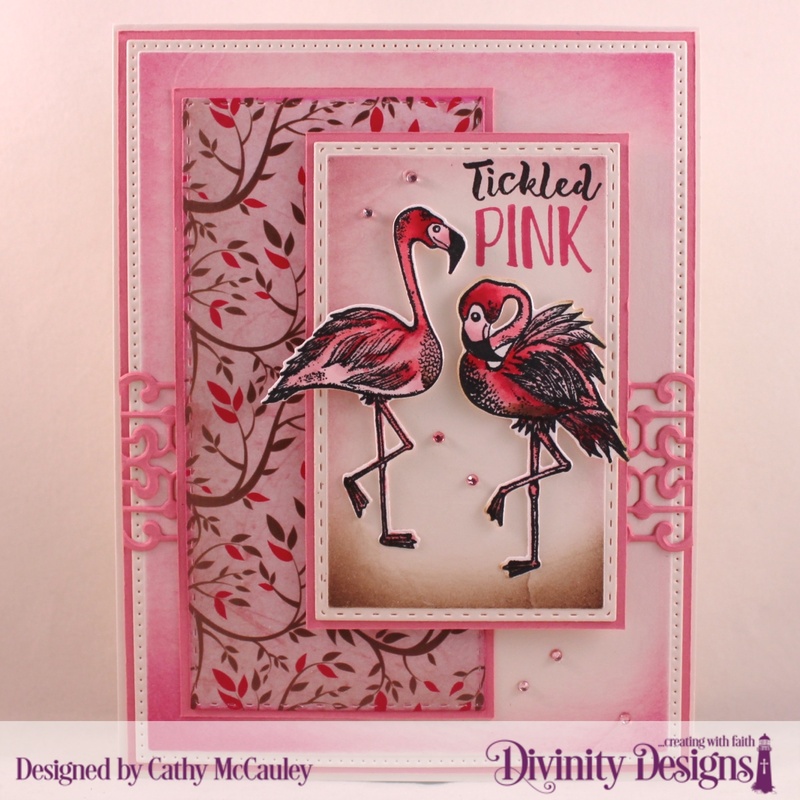 That leftover scrap of paper pairs perfectly with those beautiful flamingos! Beautiful combination of elements and shading on this girly design. Thanks for playing along with us at JUGS! 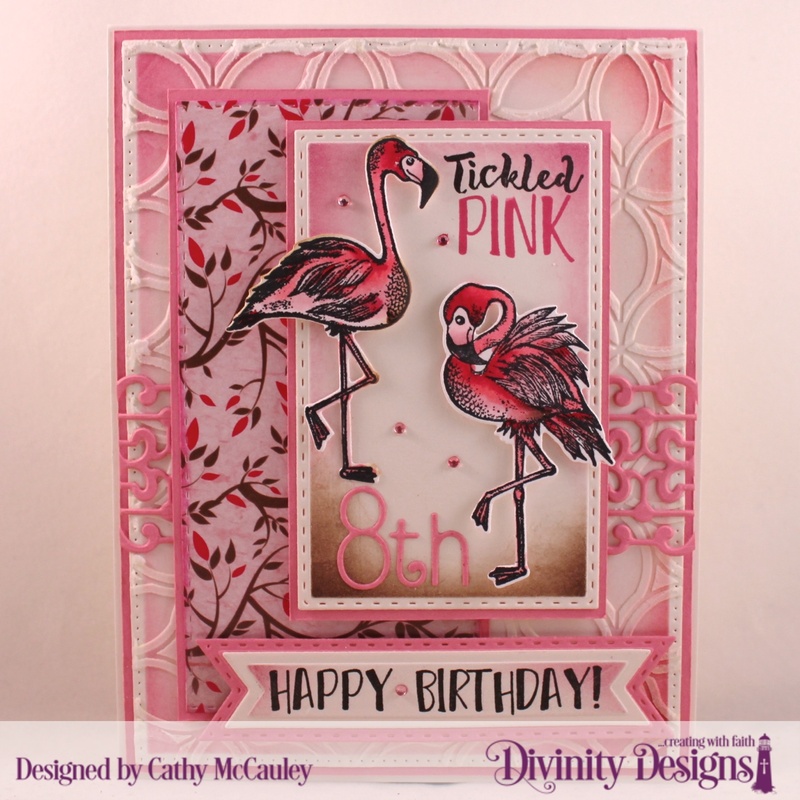 Oh my, what 8 year old wouldn't love this PINK card! It's so cute! Love that leftover pattern paper too! Thanks for playing with Just Us Girls! Oh my word, this is so fabulous! Love all the lovely little details. So glad you could join me for Mojo Monday! This is fabulous! And if she is like my granddaughter, will love this card because it is all pink! thank you for sharing this at Seize the Birthday!